When I was twelve years old and immersed in Alister MacLean, my father bemoaned the decline of reading ethics. "At your age, I could recite Hamlet backwards, you youngsters have no patience for deep reading" being the refrain. A few decades later, I have to stop myself from saying, lest I sound like grandpa, "at your age, I could read Alister MacLean in one sitting, and did not flit between 140 words" to my twelve-year-old. Ironically, this is not a new phenomenon in human history. Socrates ranted against replacing oral learning by reading. "Literacy", he is reported to have cautioned Plato, "could alter the kind of memory and probative processes required for the young to deeply pursue and internalize knowledge". Ignoring the natural resistance to change, it cannot be denied that the process of reading has changed with the emergence of digital technology. For example, the introduction and developments in e-readers in recent years, have rendered digital books competitive to conventional paper-based books. According to Pew Research Center, 27% of Americans read e-books in 2015, and this number is steadily rising. 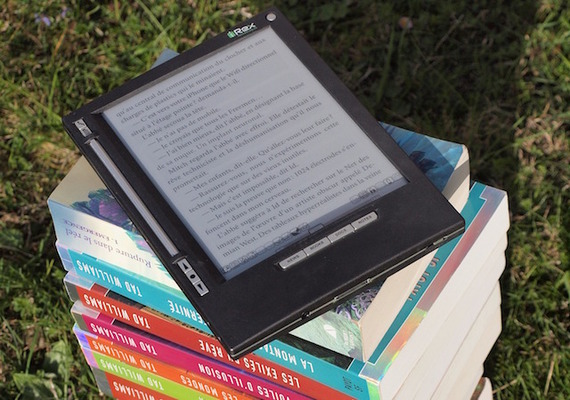 Some of the reasons for the popularity of e-books over paper books include space savings, cost cutting and reading ease; the possibility of increasing font size and backlighting in e-readers can help hypermetropic readers read more easily, to which I can attest through experience. But is there a difference in how people perceive/understand between reading from paper books and reading using digital media? While backlight and adjustable font could indeed help reading, the very same backlight has been known to already cause maladies such as computer vision syndrome. But, short of adopting Aristotle's wisdom of oral understanding rather than literary understanding, the eye would bear the brunt one way or the other. With adequate precautions (blinking more often, taking breaks, periodic eye checkups etc. ), this drawback of digital readers could be overcome. On reading a paper book, one can easily flip the pages to refer to something that appeared earlier or will appear later in the book. Such random flipping is difficult with an e-reader where, the reader has to repeatedly press buttons or swish and swipe the screen (Carpal Tunnel anyone?) for the same activity. This is particularly a problem when reading non-linear text, such as non-fiction, where need for constant reference to earlier content can be a serious problem in e-readers. That e-books could alter reading and understanding patterns among readers is not a very serious concern - either way, people are at least reading. In fact, people who read e-books seem to read more books than those who read paper books. Where digital technology seems to have had an adverse effect on reading patterns is when shallow browsing has replaced deep reading. Indeed, the advent of every new media of information and communication technology - radio, television, computer, Internet and social media - has been a threat to the reading habit at different levels. Part of this intrusion has been the usurping of concerted reading time by these addictive technological tools. The word to watch in the above statement is "concerted". Reading requires an uninterrupted chunk of time during which what is read is analyzed and assimilated and any intrusion, however brief, into this time, can render the process futile. Researchers from the Central Connecticut State University tested the effects of instant messaging on reading comprehension; one group of students read and responded to instant messages (IMs) while reading an online textbook, another received an IM before reading, but not during, and the third group read the textbook without interruption. Students who were interrupted by IMs took significantly longer to read the passage and performed poorly on a test of their understanding compared to the other two groups. The advent of social networking tools such as Twitter and Facebook has encouraged people to share and thus read short, to-the-point, thoughts. More importantly, it has fueled the need for instant gratification, something not possible while you are thinking Levin's winding thoughts in Anna Karenina. Little wonder then that the number of adults in the US, who have not read literature increased by more than 17 million between 1992 and 2002. The New York Times' series, "Your Brain on Computers," examined how digital devices impact reading and learning among children and youth. A youngster's statement that "On YouTube, 'you can get a whole story in six minutes,' rests the case! Online reading has given rise to a new style of perusing, called "F-shaped pattern", wherein the eye scans an F-shape on a page to absorb the few main ideas of the article without fully engaging with any of them. Sven Birkerts, in his essay, "The Owl Has Flown", echoes Nicholas Carr's sentiments in Is Google Making Us Stupid? that internet browsing leads not only to a lack of depth in what is read, but a lack of depth of thinking as well. The parody on the Onion, may not be a parody after all. Reading, especially entertainment reading, such as reading a novel, according to Sven Birkerts, involves an inward plunge into an imaginary world described in the novel. This inward plunge requires a considerable amount of leisure and attention span, which are essential to provide wings to the imagination. Researchers at Michigan State observed a global increase in blood flow to the brain when "paying attention to literary texts" (Mansfield Park, in this experiment), which "requires the coordination of multiple complex cognitive functions." Such focus activated various parts of the brain associated with touch, movement, and spatial orientation, in effect immersing the reader in the story. The Internet culture that is filled with competing stimuli causes the attention to flit between stimuli, thus limiting imagination and effectively killing it. Reading literary work has many levels and resonates with the reader through the use of language. The linguistic density associated with serious reading requires directed and uninterrupted concentration. Skimming-based reading fostered by the internet is addictive in that it makes directed reading a chore, thus effectively killing deep reading, and consequently, deep thought. The verdict? While e-books and e-readers could be beneficial to reading in the long run, no other digital tool bodes well. That does not mean we retrograde into the past, after all, the past is always seen with rosy glasses. The digital era is here to stay, and it is best to find a balance such that it does not compromise on a skill set that is central to our intellectual identity. Writing credit: Co-authored by Lakshmi, a Mobicip blogger and researcher who explores the eventful meeting point of technology, parenting, and education. Mobicip offers simple, effective and powerful universal parental controls software for a variety of computers, tablets and smartphones used by families today. Learn more at www.mobicip.com.